The Tawag Ng Tanghalan December 5 winner is still the defending champion from Luzon John Mark Saga. 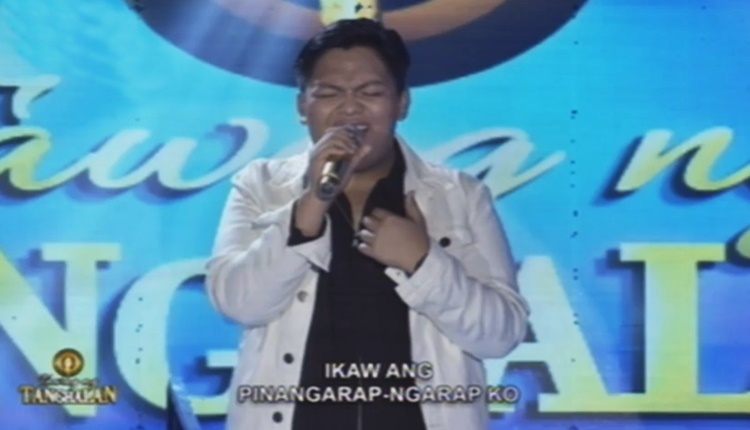 TAWAG NG TANGHALAN – The Tawag ng Tanghalan December 5 winner is still the defending champion and semi-finalist from Luzon John Mark Saga on his 10th win. The December 5 daily contenders were Maria Theresa Francisco from Metro Manila, Jen Sumalinog of Visayas, and Ruel Tandog all the way from Mindanao who respectively sang Maging Sino Ka Man, This Is My Life, and Jar Of Hearts. Among the three contestants, the one who bested out getting the highest average score of 91.8% is from Mindanao. She will be facing the defending champion for 9 times already John Mark Saga. And now, for this day’s “tapatan” in Tawag ng Tanghalan, it would be between the daily winner Tandog and defending champion Saga who respectively performed Ikaw Ang Pangarap and Ikaw. Both of them have flawlessly sung their pieces but John Mark Saga was able to defend the title and became a TNT Record Holder for having 10 straight wins in the said singing competition with an average score of 97%. The judges for today were Randy Santiago, Karylle, K Brosas, Jed Madela, and “Punong Hurado” Rey Valera.